Driving on an early May morning to Sandpoint, Idaho, to see the Quest Aircraft factory and then fly a new Kodiak 100 Series II to California, it was clear that icing conditions were not only forecast but likely in the wet gray clouds that shrouded the local mountains. 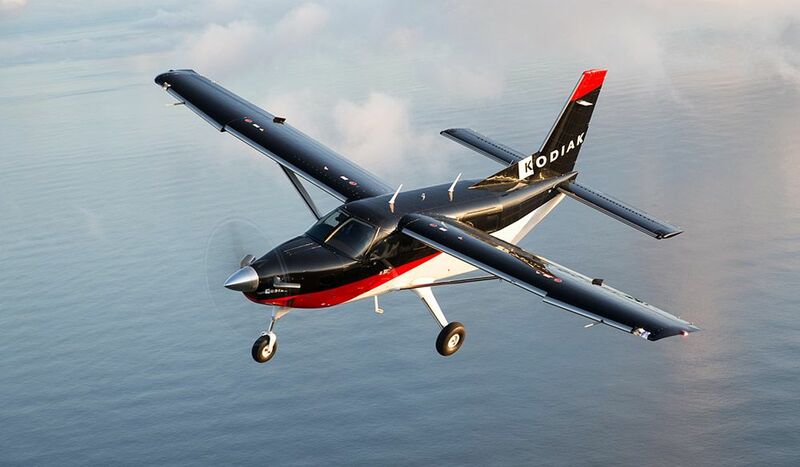 For the flight-into-known-icing-certified Kodiak, however, icing is not a problem, and in the 11 years since it entered service, the capable utility single-engine turboprop has proven its mettle in challenging flying all over the world. Today’s flight, while relatively routine for the Kodiak, would be just a taste of what the airplane can do, but it showed me that the Kodiak is tremendously flexible. It fits in to the comfortable-transportation category with handsome, comfortable interior furnishings but quickly transforms into the utility role where landing on a dirt strip in the middle of nowhere is just a normal operation. Of course, the Kodiak can land almost anywhere, with optional straight or amphibious Aerocet or Wipline floats available, and it can carry more cargo with installation of the optional belly-mounted cargo pod. Quest marketing director and chief demo pilot Mark Brown met me at Sandpoint and arranged for a factory tour before our departure. For a small aircraft manufacturer, Quest is highly vertically integrated, making almost every part at Sandpoint, including crafting 40 percent of machined parts in-house. Aluminum parts are alodined in tanks at Sandpoint, and before assembly parts are epoxy primed to prevent corrosion. About the only parts that Quest doesn’t make are composite components, for example, the cowling, fairings, and other small parts. All work in the factory is tracked on an electronic work instruction system developed by Quest. This system keeps track of time spent on each task, hosts videos showing how to do tasks, logs quality control sign-offs, and contains other assembly information. Our journey would take us over some of the highest terrain in the Continental U.S. and end in Southern California where Quest dealer Clay Lacy Aviation awaited delivery of its newest Kodiak and provided the airplane for this evaluation. Coincidentally, parked on the ramp where Kodiak N247KQ awaited was the second production Pilatus PC-24 utility jet, another airplane designed to operate from non-paved airports. The Kodiak was the first Series II—still designated model 100—off the assembly line, and after our trip, Brown would fly it on a demo tour then return it to Clay Lacy in Van Nuys, California. Brown had already planned our first leg to Truckee Airport near Lake Tahoe on his iPad, using Garmin Pilot; a two-year subscription is now included with new Kodiaks. He loaded my bag into the rear luggage area through the large rear door then stowed the tail stand, which is recommended to keep the tail from tilting back and hitting the ground while loading cargo. After Brown briefed me on the seat adjustments, I climbed into the left seat through the pilot’s door. The Kodiak sits high off the ground—propeller clearance is 19 inches—and I felt like I was sitting in an SUV, with great visibility ahead and to the sides. The front doors close with a simple pull then a push of the latch to secure the door. The simplicity of getting the Kodiak ready to fly is one of its best attributes. There is little to do beyond making sure both fuel selectors are on, turning on the aux fuel pump, then holding down the spring-loaded starter motor switch until the Pratt & Whitney Canada PT6A-34 reaches 14 percent, moving the fuel condition lever to low idle, then at 52 percent Ng, letting the switch go. Read the full article at AINOnline.com.